Review: Is The Last Row of Economy On American's 737 MAX 8 Bad? Every airline blog has covered American Airlines’ tortured new Boeing 737 ad nauseam. The tiny lavatories have been mocked from major news outlets to late night talk shows. The prevailing narrative: American’s newest 737s, the “MAX 8”, are about as customer friendly as a DMV office. Are these brand new airplanes really so bad? I wanted to find out, so I booked myself into what should be the worst seat on the plane. Like me, most passengers are probably going to be sitting in the “nosebleeds” and might even be unlucky enough to be forced into the last row of economy—next to those two tiny lavatories. So that’s what I did. I booked myself 33C, an aisle seat in the last row of economy on the 737 MAX. American has hubs in both New York’s LaGuardia (LGA) and Miami (MIA), operating up to a dozen flights daily. I’ve seen one-way pricing for this route as low as $61 for a basic economy ticket. 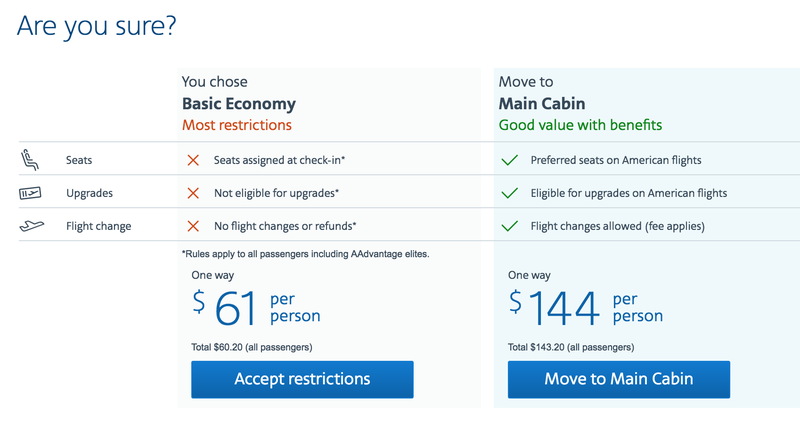 Mileage award availability is also better than many American routes. But word of warning with that basic economy ticket—the airline might auto-assign you to the same last row that I sat in. With American’s own AAdvantage program, it costs 12,500 miles and $5.60 in taxes to book a one-way in SAAver economy. However, the best redemption value here would be to use British Airways Avios. With its distance-based award chart, it’s just 7,500 Avios for the same one-way economy flight. A measly 7,500 British Airways Avios for a one-way to Miami on American. In need of some Avios? Transfer from Chase Ultimate Rewards or American Express Membership Rewards. There’s a 40% bonus for transferring American Express Membership Rewards points to Avios through November. That means 5000-and-change MR points for a one-way. That’s an amazing value, whatever aircraft you end up on. I redeemed 7,500 Avios on British Airways’ website, found my reservation on American’s website, and selected my seat in the way, way back—you couldn’t get any deeper into economy than this. Let’s start with space. 172 seats were squeezed onto this aircraft, 12 more than the last-generation 737. How do those seats magically appear? Why of course—less legroom, slimmer seats, and smaller lavatories and galleys. The 737 MAX has 16 first class seats with 37” of pitch, 30 Main Cabin Extra with 33” of pitch, and 126 Main Cabin seats with 30” of pitch. That’s an inch or two decrease across the board. American had originally planned for the last three rows of economy to have 29” of seat pitch. After some serious backlash and negative press, they decided to reverse course and retain the 30” of pitch like the rest of Main Cabin (still a 1” decrease from the current 737-800 but that’s getting a retrofit as well). American has seen an increasing number of deliveries for the MAX since November 2017—primarily at its base in Miami but it’s getting harder and harder to avoid this aircraft. En route to LaGuardia, I noticed that I was #1 on the upgrade list with two empty seats in first. No thanks! My first stop was to the check-in counter to un-request my upgrade. After a moment of confusion about why I wanted to remain in row 33, the agent removed my upgrade and I went along to the AMEX Centurion Lounge. At LaGuardia, it’s located before security one floor above the check-in area. American Express operates these premium lounges at a handful of airports with access for Platinum cardholders and Centurion cardholders. They’re awesome spots to relax, have a meal, or get work done—when they aren’t insanely overcrowded. AMEX sometimes has Centurion Lounge-branded pop-ups, as I experienced just a few weeks ago at the U.S. Open. Thankfully, there were no crowds to fight through this morning. The lounge has been covered numerous times before, but I found it once again to be a great spot to grab a coffee and a light meal before my scheduled 8:29am flight to Miami. I left the lounge at 7:40am and walked 5 minutes to the D gates. I whisked through TSA PreCheck in a few minutes and was at Gate D7 by 7:50am, four minutes before scheduled boarding. Boarding was set for 35 minutes before departure—instead of the standard 30 minutes. Annoyingly, this wasn’t communicated to customers. View From The Wing covered this a few days ago. This was moot, anyway, as the aircraft just arrived from the hangar as I made my way to the gate. I also noticed my name was still displayed on the upgrade list but sure enough I was skipped over and #2 and #3 on the list were upgraded. You’re welcome #3. Once I got to 33C, I surveyed the situation. The first thing I noticed was the seat was almost flush with the rear lavatory wall. The rest of economy isn’t that much better with just 2” recline, down from 4” on the 737-800. Also, notice how the lavatory wall is curved to make space for this last row of seats. On the other hand, overhead bin space is ginormous and I loved the Boeing Sky interior ceilings—for some reason, the cabin just felt airier than other aircraft. Legroom-wise, it really wasn’t that bad compared to other economy seats, due mainly to the slim design. With that said, I am only 5’7”, but I imagine even someone up to 6” wouldn’t have major issues. There was sufficient space carved out under the tray table. Above the tray table and in lieu of a seat-back screen was a magazine holder and a device-holder contraption for streaming entertainment. Nifty. American made the rather controversial move to eliminate seat-back entertainment to save on fuel and maintenance. I’m personally not a fan of stream-to-your-device entertainment services, which means relying on opening my laptop on a tray table and straining my neck downwards to watch. I don’t own a tablet and my phone screen is too small. Screen holder and USB port in lieu of a seatback screen. One strange thing was the manual safety demonstration—no screens anywhere meant that the flight attendants had to do things the old fashioned way with a PA announcement and demo in the aisle. Unfortunately, the flight load was very light—I wanted some real-world scenarios with a packed flight but alas, that wasn’t going to happen. Instead I moved around in different positions from aisle to middle to window. I don’t have particularly broad shoulders but I felt the fuselage certainly intruded on my shoulder space in the window position. With such a light load, I got to speak to a couple of flight attendants who basically despised the aircraft. The lavatory size and lack of screens were frequent customer complaints. In addition, the galley was set up in a way that was annoying from an operational perspective (even after a retrofit). The primary issue wasn’t galley space but was with the set up of various galley “compartments” that resembled a grid instead of the normal straight columns that made things easier to maneuver. At the seat, I appreciated the small touches like a USB port at eye-level, a power outlet for each seat placed in front of me instead of under my own seat, and cradle headrests. Super-slim seats did mean that padding was minimal but entirely fine for the 2 hours-and-change journey. However, a transcon on this bird though would probably make my booty beg for more support. I verified the atrocious recline of the seat. It might as well remain in the fixed position. Also, not-so-lovely odors were emanating from the lavs. I’ll be the first to say it: once inside, it really isn’t as bad as they say it is. Yes, it’s narrow as heck but if you’re of average size, it’s entirely manageable. And to be honest, it’s well designed with tissues, towels, and the necessities where you expect them to be. There’s also this neat, little shelf that serves as a holder for essentials when you’re on the loo—or probably more likely to do your makeup. One thing that remains an issue is the sink. Strong water pressure was a problem initially, soaking everything including your own clothes and half of the lav. American addressed this by putting a filter on the faucet but that really didn’t fix it. The size of the sink is just absurdly tiny. The only true resolution would be to make the sink larger. And that’s not happening. Flight attendants also had to warn flyers as they queued up for the lavatory to avoid being whacked by the outward swinging doors. Maybe it’s the soothing blue lighting that got me, but I thought I would hate the lavs way more than I actually did. No Wi-Fi onboard this MAX. Unfortunately, Wi-Fi was not functioning but streaming entertainment worked and was easy to use on my laptop. It’s worth noting that the selection was significantly more limited than what American offers with their seatback entertainment. And no moving map is a disappointment. With the seat in front of me reclined, there was a lot of strain on my neck to look down onto my screen. The rest of my flight was fairly uneventful with great service from the young flight attendants. After experiencing it for the first time, I have to say that I don’t think so lowly of American’s 737 MAX anymore. There are a ton of negatives for sure — less legroom, more seats, smaller lavatories, lack of in-seat entertainment — but I actually enjoyed some of the things that American likes to tout in its press releases, like USB outlets, the airy Sky Interior, and massive overhead bins. But like many things at American, the areas where the airline excels is brought down by its abysmal implementation for some of the fundamentals. The 737MAX fits into this exact category. While I expected worse from this airplane by the time we arrived in Miami, that’s still different than saying this was a great experience. It’s just that the bar for American narrowbody planes is so low. I’d rather fly the MAX than a pre-merger US Airways aircraft without power. In terms of the 737-800 that this MAX is eventually replacing, I would call it a draw. I survived the last row on the MAX and probably could tolerate it again for another two-hour journey. Any longer and I’d beg to sit out. A shout out to you for the excellent review. My pet peeve is that 99% of airline blogger reviews are for business and first class travel (mostly international) when fewer than 1% of Americans fly in those cabins regularly. It’s really these guys satisfying their vanity and coveting of luxury than providing useful information for travelers. After all, isn’t providing a great service for your readers that’s relevant what blogging is all about? Thanks again! Thanks Don! I’m relatively new to this but my goal is to be a go-to source for the average AvGeek and semi-experienced traveler—all the while not taking itself too seriously. So that doesn’t always mean reviewing an international first class redemption. After all, a lot of my inspiration comes from what my friends and family ask me, and many of them don’t have the cash or miles on hand to always fly that glamorously. If you REALLY wanted to test it out you should have booked the middle seat and stayed there. And speaking of “average size” what really does that mean. Plenty of reports out there about how obese the “average” American has become. Try and cram one of them in the bathroom. I agree on the middle seat part, although he did at least try to get a packed flight. As to size, I’m 6’5 and 270, so I get bruised knees a lot on planes anyway. Your comment about big Americans definitely applies to me. Also, I wonder if the person in front reclined, since that makes a tight seat really small, even in good economy seats. Actually, I tried to get a middle seat but all seats in the last two rows were shown as occupied on the seat map, even a few hours before departure. However, I think 33DEF are sometimes blocked for crew. I ended up having 33ABC empty as well. Row 32 was full but even with the seat in front of me reclined, it was fine for my 5’7″ frame. However, for anyone over 6′, I would be very uncomfortable. I imagine those 2″ of lost space from the seat recline in front would make a significant difference (even if this is down from 4″ on most aircraft). It’s just a big regional jet now. Shoot, the regionals have much more leg room. Well written review that shows that the plane isn’t as bad as some so called travel experts make it out to be. Legroom isn’t any worse than any other US domestic airline, and normal sized people can use the lavatory just fine. If flights like these are as low as $60 each way, then a RT for 2 passengers would only be $140 (total) after the VISA Infinite $100 credit! You would think people would be more excited about $33 flights from New York to Miami. Thanks for the high level of detail in the review. I would not want this plane for a transcon, but for less than 2.5 hours it would work for me. Thanks for this review. I think I flew this same plane on a United flight. I would have preferred an actual IFE screen but my flight was short (4 hours) so it was fine. As far as the bathrooms, they were tight, but doable.